2014 Volunteer Awards – And the Award goes to…. 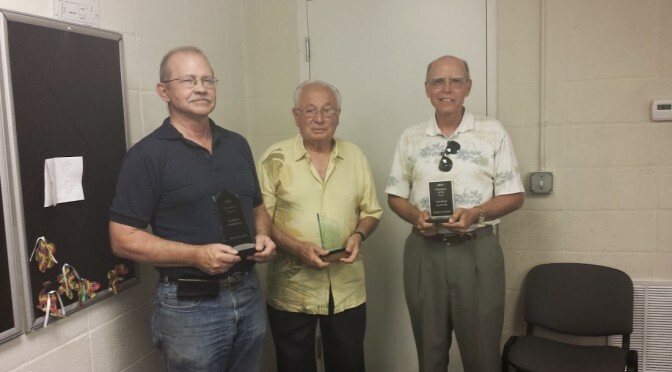 Monday night, President Roger Kastel presented this year’s Volunteer Awards at the Annual Meeting. Here are his notes. Photos by Al Martinez. The Distinguished Service Awards are presented by the Naples Free-Net Board of Directors for unusual contributions to the NFN. Bob Luparello – has worked tirelessly on the Budget, the Investment program and continuously labors with the Treasurey. His outstanding monthly reports keep us generously informed on the Board. James MacDonald-labors as the Education Administrator, he dedicates many hours setting up classes at various venues, has been instrumental in setting up NFN for Good programming. Our Education Department is second to none. I take pride in presenting with the Distinguished Service Award. Birgit Pauli-Haack – working as our Webmaster, spends countless hours working on the NFN website, NFN4Good website and the SWFL 501 Tech Club website. Birgit also serves as a member of the NFN BOD’s and also on the NFN Tech Team. Birgit has come to be one of the indispensible persons I rely on to get things done here at the NFN. I am proud to present you with the Distinguished Service Award. Mary Ann Wallace – Works as the NFN DSL Administrator, wherein she labors many many hours a week, keeping DSL members access to the World Wide Web available. She has to deal with our member the customer, Century Link – hard line pair supplier and Netally – the actual DSL service provider; and then there is the monthly billing cycle that always seems to have lame credit card problems to deal with, and then there is auditing of the monthly bill from Netally. It is my pleasure to present you with the Distinguished Service Award. Dennis “Duke” Vasey – Who was tasked with generating a Marketing Plan for NFN. Much study on his part looking at where salebility is generated – you@naples.net being a valuable commodity, the Internet of the future – it’s in your handheld device, generating one-on-one services through Tech services and training. Many categories go into a Marketing strategy, Duke looked at seemingly endless options. A great job has been done by one who stepped up to the plate and did the job at hand. I take great pride in presenting you with the NFN Distinguished Service Award. George is a volunteer who has great patience in dealing with NFN members and the Helpteam members, for he is the Helpteam Coordinator. He has a tremendous capacity to get things accomplished with the limited amount of Helpteam Volunteers he has to work with. George is a very valuable member of the NFN staff, as he also serves on the BOD’s and as the Vice-President. It is with great pleasure that I present you with the Volunteer of the Year award. The Presidents Award is to recognize the activities of a BOD member who, through various activities, has shown a broad perspective in leadership within the organization. This year it gives me great pleasure to present it to Warren Anderson, our Systems Administrator. I am constantly reminded of Warren’s vast knowledge of Server administration.His technical knowledge keeps our vast array of migrated old and newer servers up to date, so access to the World Wide Web, for NFN members is always available. I want to personally thank him for all the time and effort he puts in for the pleasure of the Naples Free-Net members. I am proud to present him with the NFN Presidents Award.